Over-the-counter, (OTC) dental products are oral care products sold directly to a consumer without a prescription from a healthcare professional. In the recent years, there is an increase in a number of the OTC products which make false claims and without sound scientific evidence. In many developed countries, OTC products are regulated by federal regulatory agencies such as the Food and Drug Administration and also by the countries professional dental organizations such as the American Dental Association (ADA). ADA provides a seal of approval to those products, however, in many developing countries; the OTC dental products are not regulated due to lax rules. Vendors use this opportunity and are marketing OTC products without sound scientific evidence. While in the some developed countries of Northern America professional bodies provide with their seal of approval for many OTC products. This will help individuals to make their choice. This review paper presents an overview of OTC dental products with questionable scientific evidence and their effects on the oral health. The main purpose of the review is to highlight the need for regulation in the sale of these OTC dental products. In some developing countries, the regulatory agencies which are approving/disapproving these OTC products are not strong. In other circumstances, the implementation of the rules of the regulatory agencies is weaker. In these countries, markets are flooded with OTC dental products without approval from the concerned regulatory agencies. This review focuses on the some of the OTC dental products which are not backed by sound scientific evidence and also highlights the need for regulations among OTC products for oral health care. In the following section, authors highlight the few of the OTC dental products which are short of sound scientific evidence. Halitosis can be a result of both intra- and extra-oral causes. Evidence-based treatment of halitosis is always etiology-based. Many advanced diagnostic tests are available to diagnose halitosis. One of the commonly used treatment methods for halitosis is the mouth freshener. These mouth fresheners are available in the form of sprays, chewing gums, and candys. 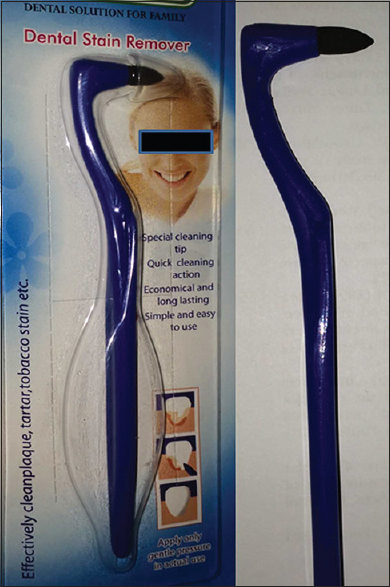 A commonly available mouth freshener in the spray form is shown [Figure 1]. However, these mouth fresheners provide symptomatic relief to the patient and mask the actual problem of halitosis. This temporary relief from halitosis may actually worsen the severity of halitosis. Patients may not comprehend that the real cause of halitosis was never diagnosed. ADA in 2003 documented acceptance guidelines for the management of oral malodor. 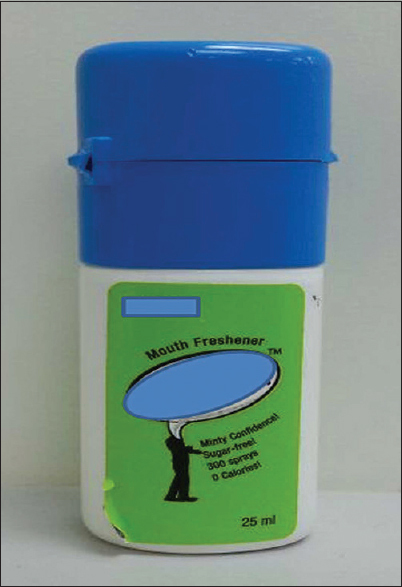 All of the mouth fresheners do not meet the guidelines for the management of oral malodor. Patients need to make aware of the mouth fresheners capacity for only symptomatic relief from halitosis. Pregnant women across the world receive special care during their maternity period. This special care is given to make sure that both the mother and the developing newborn are safe and healthy. Perinatal oral health plays a crucial role in the overall health and well-being of pregnant women. It is also needed for the health and well-being of developing new born. Moderate to severe generalized periodontitis in pregnant women has been linked to adverse pregnancy outcomes including pre-eclampsia, preterm birth, and low birth weight babies. However, more research is needed to confirm the pathogenesis of periodontitis relating to adverse pregnancy outcomes. Pregnant women are at increased risk of developing caries due to their possible avoidance of brushing owing to increased chances of nausea and vomiting. 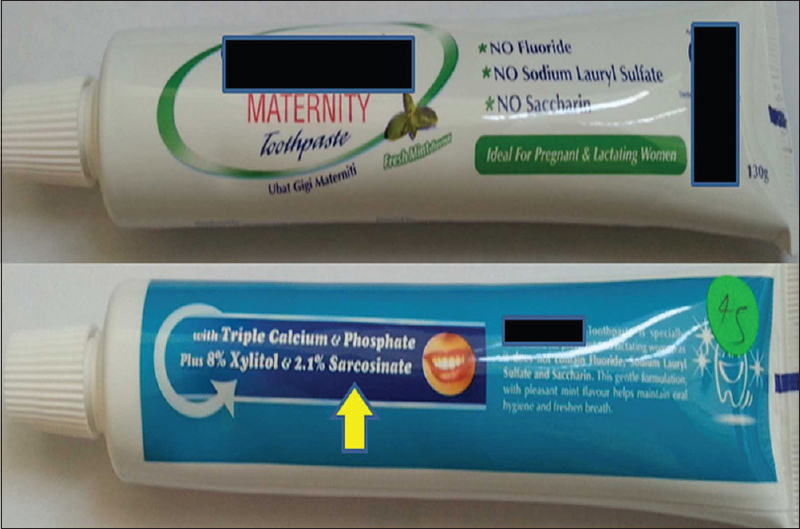 Maternity toothpaste are being marketed in Malaysia and South East Asian countries which are free from fluoride, sodium lauryl sulfate (SLS), and saccharin [Figure 3]. These toothpaste claim to be specially formulated for pregnant and lactating women. A wrong message is being sent out to the consumers that presence of SLS and saccharin in the toothpaste could lead to dry mouth in the pregnant lady (due to SLS) and harm the fetus (due to saccharin). These maternity toothpaste are being promoted, citing unrelated toxic effects of fluoride without sound scientific evidence. 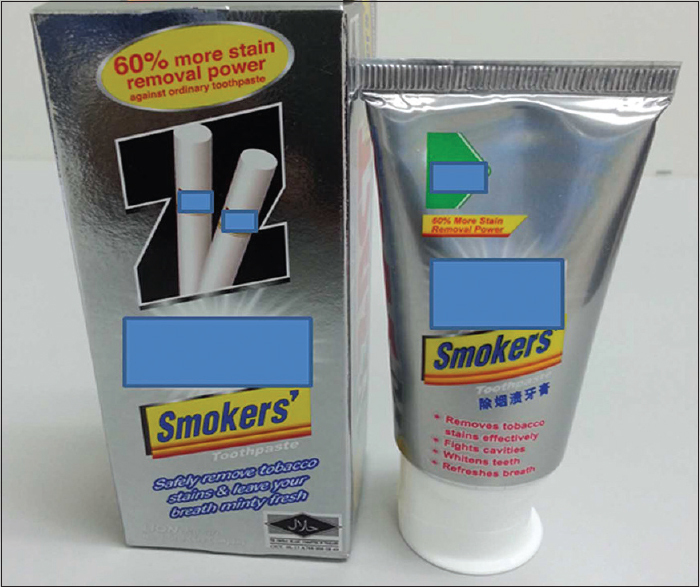 Ironically, instead of SLS, sarcosinate another foaming agent has been used in this maternity toothpaste [arrow mark in [Figure 3]]. Consumption of balanced nutritious diet and the use of fluoridated toothpaste has been recommended by the guidelines from the American Academy of Pediatric Dentistry. Fluoridated toothpaste in pregnant women are highly recommended due to the increased risk of caries in pregnant women due to possible negligence in oral hygiene. The guidelines state that fluoride certainly helps prevent dental caries in pregnant women and nursing mothers pass on very little fluoride to their infants. Research also suggests that fluoride exposure from community water or from products, such as mouthwashes and toothpaste, are most likely safe for both the mother and the unborn child during pregnancy. The dental practitioner should create awareness among the public regarding the safe ingredients in the toothpaste and their benefits. This will help in reducing the patient's doubts about the safe usage of fluoride in dental consumer products. Various marketing strategies, tall and false claims by the vendors and dental suppliers have resulted in the increased use of OTC products. According to the oral care products in USA 8 th Edition, OTC dental products sales are increasing every year and generated 4.9 million USD in the year 2012 and by 2017 the retail sales will reach 6 billion USD. In order to increase the sales many of the market leaders in oral care products, sell their products as a complete oral care package. The companies also market their products by projecting the dental products to achieve professional results at home. This has resulted in many consumers avoiding professional treatment since the OTC products are less costly compared to professional treatment. Introduction of new dental products into the market should be evidence-based and supported by scientific studies. These studies must be ethical, avoid bias, and be suitably controlled. Where appropriate, new products should be compared with products already available and used by the general public. Awareness among patients regarding OTC products which are of dubious nature should be done. This should be included in the oral hygiene instructions of the patients. OTC dental products without any scientific evidence are a small part of a much bigger issue. The issue is of concern for dental esthetics over dental health. Focus, especially among OTC dental products has shifted from oral hygiene to esthetics. Esthetics, of course has its own vital importance, but should be evidence-based. The dental community should stress upon maintaining an oral cavity free of gingival/periodontal inflammation and dental caries. The indiscriminate use of OTC dental products should also be discouraged. OTC products without sound scientific evidence could actually risk the oral health of patients. Professional bodies of countries should initiate a seal of approval programs with stringent criteria for the manufacturers to meet. Regulatory agencies should be created which would help the professional bodies in this process. This would result in improving the quality and standard of OTC dental products entering the market. They also would put a cap on the dubious OTC products from entering the market. Over the Counter Drugs. Available from: . [Last accessed on 2013 Nov 23]. Maltz M. Over-the-counter preventive and therapeutic oral products. Braz Oral Res 2009;23 Suppl 1:4-7. Rippere JL. FDA regulation of OTC oral health care drug products. J Public Health Dent 1992;52:329-32. Whall CW Jr. The how and why of the ADA′s evaluation program for dental therapeutic products. J Public Health Dent 1992;52:338-42. Scully C. Halitosis. Clin Evid (Online) 2014;2014. pii: 1305. Acceptance Program Guidelines Products Used in the Management of Oral Malodor. Available from: . [Last accessed on 2014 Nov 23]. Shmuly T, Zini A, Yitschaky M, Yitschaky O. Can black extrinsic tooth discoloration predict a lower caries score rate in young adults? Quintessence Int 2014;45:439-44. Lee RJ, Bayne A, Tiangco M, Garen G, Chow AK. Prevention of tea-induced extrinsic tooth stain. Int J Dent Hyg 2014;12:267-72.
van Loveren C, Duckworth RM. Anti-calculus and whitening toothpaste. Monogr Oral Sci 2013;23:61-74. Guideline on Perinatal Oral Health Care by American Academy of Pediatric Dentistry. Available from: . [Last accessed on 2014 Jul 26]. Gum Disease and Women by American Academy of Periodontology. Available from: . [Last accessed on 2014 Jul 26]. Masalu JR, Kikwilu EN, Kahabuka FK, Senkoro AR, Kida IA. Oral health related behaviors among adult Tanzanians: A national pathfinder survey. BMC Oral Health 2009;9:22. Ramachandra SS, Dicksit DD, Gundavarapu KC. Oral health: Charcoal brushes. Br Dent J 2014;217:3. Carey CM. Tooth whitening: What we now know. J Evid Based Dent Pract 2014;14 Suppl: 70-6. Oral Care Products in the U.S., 8 th Edition. Available from: . [Last accessed on 2015 Jan 22].